Who are Friends of Gloucestershire Libraries (FoGL)? We are a group of library users from across the county of Gloucestershire, who first got together in August 2010 to provide a forum for library users’ involvement in the service. We started life as Friends of Cheltenham Library, but following huge interest, expanded into a county-wide group. In November 2010 Gloucestershire County Council announced plans for devastating cuts to our library service. Since then Friends of Gloucestershire Libraries has been at the forefront of opposition to these deeply damaging and ill-thought out plans. LATEST NEWS: Following the November 2011 High Court ruling that Gloucestershire County Council’s original plans for our public library service were unlawful, a new library strategy has since been implemented. Three libraries originally earmarked for closure (Hesters Way in Cheltenham, and Matson and Tuffley in Gloucester) have remained part of the public library network, with 21 hours per week of statutory provision and council staffing, supplemented by volunteers. Seven libraries have been closed and are no longer public libraries but have been ‘transferred’ to the community to run and fund themselves, cut off from the public library network. A decision on the future of mobile libraries (all to be withdrawn under the original plans) has been deferred pending public consultation. Read our reaction to the new plans here. 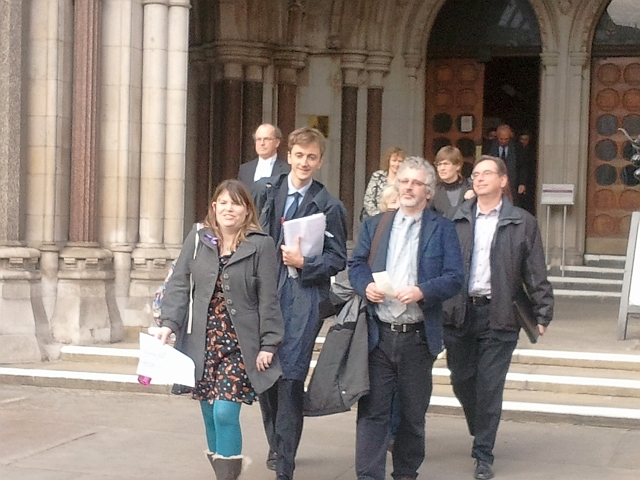 On Wednesday 16th November 2011, His Honour Judge McKenna ruled that Gloucestershire County Council’s plans for our public library service were unlawful on equalities grounds. See here for more of the legal details in a statement from Public Interest Lawyers, and read our response , media coverage of this landmark ruling and response from Gloucestershire library users. The ruling followed over a year of campaigning, the granting of permission for judicial review back in July, and a three day High Court hearing in September. The judge quashed GCC’s plans for the library service entirely, awarded full costs to the claimant, and denied permission to appeal. Unfortunately Council Leader Mark Hawthorne attempted to downplay the ruling’s implications and issued confusing statements to the press. A useful briefing note from Public Interest Lawyers explaining the full implications of the ruling can be found here, as well as the full transcript of the judge’s damning ruling. A public meeting was held on Wednesday 14th December (read an attendee’s report here) to discuss the ruling and ways forward, and was well-attended by library users, representatives of community groups, and councillors, although we were disappointed that GCC Cabinet member and senior officers declined to come along. FoGL members have since met with senior GCC officers to present our concerns.